This is a standalone, identical version of the DLC from Assassin's Creed IV: Black Flag. 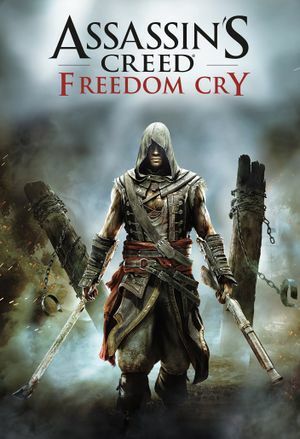 Shares many similarities with Assassin's Creed IV Black Flag in terms of its engine and performance. Anamorphic 16:9; use Flawless Widescreen to remove letterboxing. TXAA (Nvidia only), FXAA, SMAA (actually SMAA T2X) and MSAA/CSAA (also using FXAA). Double buffered. See Force triple buffering. Frame rate is capped at 63 FPS. Run game and choose a resolution of your choice. Alt+Tab ↹ to the desktop. Open WinExplorer and select ACFC from list of running programs. Head over to style tab and tick WS_DISABLED and WS_CHILD checkboxes. Don't force VSync in D3DOverrider, only triple buffering. If you're using SweetFX or another injector, this solution may not work (use workaround below). Add a profile pointing to ACFC.exe. Click on the exe profile to select it. Go to the tweaks tab, leave VSync to driver default, and check triple buffering. This method was tested on Windows 7 SP1 on a PC equipped with an Nvidia graphics card. Click the cancel button (or use your Escape key) to return to the desktop. Go back to the game by clicking its icon on the taskbar. This workaround makes possible the use of SweetFX or other injectors with triple buffering. Mouse acceleration is present. Can't be disabled. Sliders for music, effects and voices. Supported video cards include: Nvidia GeForce GTX 260 or better, GT400, GT500, GT600, GT700 series or AMD Radeon HD4870 or better, HD5000, HD6000, HD7000 series. Laptop graphics cards may work but are not officially supported. ↑ 1.0 1.1 File/folder structure within this directory reflects the path(s) listed for Windows and/or Steam game data (use Wine regedit to access Windows registry paths). Games with Steam Cloud support may store data in ~/.steam/steam/userdata/<user-id>/277590/ in addition to or instead of this directory. The app ID (277590) may differ in some cases. Treat backslashes as forward slashes. See the glossary page for details.